This is one of the best podcast I have heard around the NBA. I love Eric Gee and what he does. His passion to put out podcast everyday is priceless. Every since Eric took over for Fred, I have never missed one of Eric podcasts. Keep it up fam. Appreciate the daily updates. Erik Gee is great! Keep up the good work! I like that Erik Gee knows most people that want to listen to a daily pod would like that dose at or about 20-25 minutes. Great sound production and content make for easy listening. Keep it up Gee. Stop talking about OU so much. I am a Texas Tech alum and love OKC Thunder. You are making OKC Thunder and OU seam related and turning me off of them. Not great. Not the worst ever. The last thunder podcast I listen to. 2 stars for posting so much content. But I feel like he talks about himself, is telling you about what heâs going to talk about before he talks about it, or has adds playing taking up over half of the 20-30 minutes. I love listening to this Podcast, and Iâm a Jazz fan from Salt Lake City!Iâve been listening since the Jazz-Thunder playoff series last Spring. I enjoy listening to the podcast because Eric provides valuable information and is a joy to listen to. Thanks!!! This pod is awful now, gee is terrible, probably should find a new profession or cover childrenâs leagues, heâs so corny and does not seem to be up on okc. Even worse than Carson Cunningham, okc pod has been terrible since Fred Katz. Would encourage fans to go to down to dunk, thunder buddies, thunder heads for better okc pods, hopeful this one improves. Love Love Love the Gee-Man! I love the way this show is formatted and delivered! I praying ðð¼ that the new Locked on Oklahoma podcast will be just as brilliant. Good stuff indeed! Thank you for always giving an interesting, informed and honest take Mr. Gee! Man... itâs still so brutal. He tries to be funny or something. I wish David Locke would find someone else. Fred Katz and Carson Cunningham were great. There are others in the OKC market that could be better. I think that this podcastâs current 5 star-ish rating is because of Fred Katz who is unfortunately gone now. Not the guy currently running the show. I will say that it has to be tough to do a podcast everyday so do I give him credit that he produces many episodes. However, I think that heâs able to produce so many mainly because heâs just able to talk his random opinions for crazy long periods of time. For example, Iâve heard his opinions on Carmelo Anthony in full like 10 times in the episodes Iâve listened to recently. Youâre not going to get good takes on basketball strategy, stats, or anything substantial like that. You'll just get rambling opinions on more surface level thunder things. I just personally really donât like the content or the format. I also leave every podcast angry about something he has said lol. I think it has something to do with the way he says things like they arenât negotiable at all. It feels like he oversells his opinions as the hard truth. And since the format for these pods is one dude talking the whole time, you donât get any break from it or chance to hear counter arguments. Maybe some will like this type stuff. Itâs just not for me. Used to be a fan. I used to be a big fan a couple ofYears ago. Fred Katz was amazing! I really donât like Erik Gee, his takes feel a little to much like sports center. There is way to much whining. Thereâs a way to say the warriors are gonna win it and still make thunder basketball fun. Erik does not know that though. Unsubscribed. Where is the Paul George News? It's the first podcast since the Thunder lost in the 1st round to an underwhelming Utah team that got blown out in game 1 against the rockets. Everyone is wondering why would Paul George stay. We want some reassurance or to hear it straight and rip the band aid off. So what does this podcast decide to focus on, Melo and his potential free agency. Not a word about Paul George in the description or in the podcast. We already know Melo is financially glued to exercising his option. This is not just irresponsible, it's basically a fake news tactic (covering a non story to distract from major stories), its propaganda! Idk the knew host name but he started off good kinda knowledgeable about what he was speaking on until we get to the end of podcast and he goes on to say that in his estimation Anthony Davis is the clear front runner for MVP over James Harden...... that right there letâs me know I cannot take this podcast seriously. I know biased plays a big role being that Harden is a former Thunder. But no one who watching basketball this year with a clear and unbiased position can see whatâs actually happening here. I listen to the Warriors, Rockets, and Thunder podcast whenever I find them available. The Thunder just got removed from that list. I'm thinking Carson Cunningham must have gotten fired for not putting out enough episodes.. Fred Katz was so much better. Fred used to post M-F. Carson might post twice a week. I need more content. Content is good when he posts, but also does really short pods. Would like longer more often pods. Carson is doing a great job and this is going to be an exciting year! I really enjoy Locked On Thunder having Carson Cunningham at the helm. Heâs one of my favorite Oklahoma sports personalities so Iâm excited to see what he does with the podcast. I loved Fred Katz and the transition to Carson has been seamless and Iâm still excited about it. Looking forward to this season! Very in depth coverage of the Oklahoma City Thunder franchise. Really great podcast! Carson Cunningham does a great job! This was awesome. Very interesting. Great work. Carson Cunningham for the WIN! Carson has been one of my favorite guests on the Down to Dunk podcast and Iâm so glad heâs taken over this podcast! Fred Katz has been a great addition to the Thunder beat. It's refreshing to have an outsider on the beat. He always brings in journalists from all over, which I really like. 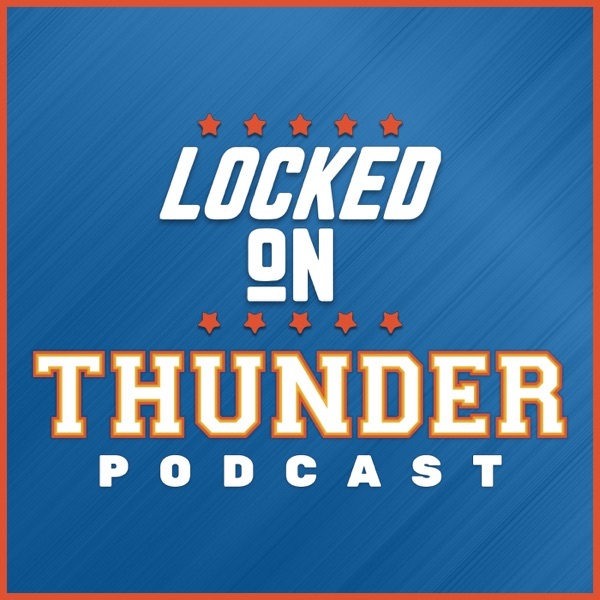 It's fun to jump back and forth between a thunder fan news podcast in "Down to Dunk" and a more objective thunder news podcast in "Locked on Thunder". To be clear, I love them both! Great podcast for in depth Thunder news and entertainment. Good guest lineup. Love listening to Fred and his guests. They're all well-informed and the information that's presented is great. I also enjoy that the talk sounds genuine, fluid, and more like a conversation than how interviews can sometimes come across as stiff. The regularity with which the new episodes come out are great too! Following these Backstreet Boys revelations, I've pitched my tent in the Huestis camp. That said, love the podcast and look forward to it every week. We need an update on the Hamm/Royce standings, though. Much respect from the East Coast. Holding it down till you return. Cheers. It is a very informative and fun podcast. Fred is great and so are his guests. I listen to this show every day during work. Fred Katz does an incredible job wth this podcast along with the colleagues that he brings in. It is very informative, and sometimes Fred even makes me laugh. John M. Hamm is the man and Royce Young also brings in thoughtful insights to the podcast. I would highly recommend the Locked On Podcast Network to any NBA fan. Until next time, Locked on Thunder is locking up! Way better than down to dunk! Great pod! Fred is funny and has a great personality. Worth your time! As an overall NBA fan, I listen to many of the Locked On podcasts. Fred Katz is an incredible host, he has some great comedic timing and instincts. He has a great chemistry with his guests and a fantastic knowledge of the game. An episode with Josh Huestis is very memorable, it was hilarious, I could listen to those 2 everyday.Fred Katz gets the info and commentary out in a timely manner, and while he's presenting for a Thunder team, it doesn't feel like he's a nearsighted homer like most Celtic or Laker fans. Overall this is a great podcast. If you were to get rid of the whistling intro I'd give it 6 stars. Fred Katz is a living legend. He does a very nice job covering the thunder and sharing his knowledge on the team and basketball in general. My one piece of advice to Fred would be to stick to the puns. While he does an excellent job covering the team his puns are otherworldly. Keep up the great puns and good basketball coverage. Fred Katz is the best and most insightful beat writer for the Thunder. For going solo on the podcast he's able to cover the full spectrum of each Thunder game. Would be a 5 star review but the hipster whistle rock song at the beginning is atrocious! Hey, a reporter from New York, working for a paper in Norman, covering the Oklahoma City Thunder 5 days per week, sometimes from his car. What more could you ask for? I like Katz's schtick. The fact that he can produce an entertating podcast 5 times per week before the season even starts is a testament to his podcasting chops. This one is in my rotation now. Interesting insight into the team, must listen for any Thunder fan. Great work, I like the daily podcasts. Great daily podcast. Can't wait to listen once the season starts. Thanks for all the coverage, Fred! Fred's pod is the Katz meow. I apologize for that title. BUT, the pod is great!! A whole lot of great Thunder basketball talk, a few arrested development references, and Royce's Voices. Doesn't get much better than that.